If getting married in Austria appears to be an exciting yet daunting prospect, then there is no need to be concerned. Our big day was arranged through Austria Direct at relatively short notice, Susanne Dangl, (Susi) did an outstanding job of organising everything down to the very last detail, all we had to do was attend! thus helping to make our wedding the wonderful occasion that it was amongst the stunning scenery of the Tirol. Thank you. Just over 5 weeks since our wedding day in Mayrhofen and we are trying to encapsulate the efforts and skill of Susi, your wedding planner for that resort. This woman is absolutely incredible! She was a pleasure to talk to via Skype and e-mail in advance of the wedding. Nothing was too difficult and she had a solution for everything. Her levels of organisation were so apparent, and she was able to deal with our e-mails whilst handling several other weddings at the same time. We met Susi 6 months ahead of the wedding and this was a great opportunity to get to know each other, and some reassurance for us, as it is tough planning a wedding in a different country. When we next met a few days before the wedding, she was so attentive, friendly, fun and professional. On the day itself, Susi DID NOT STOP. She was working so hard from the moment she arrived to the moment she left us. She remained very discreet, but also made herself known to key people, and everyone commented on how completely lovely and hardworking she was! We could not have had such a perfect wedding day without Susanne Dangl being behind it all. A HUGE thank you – and danke schon to you Susi – you are a fantastic woman, and we hope we get to see you again in the future – maybe for a day on the Kitzbühel slopes. Thank you so much for putting us in touch with Susi (Susanne Dangl) in connection with our wedding (in Kaprun). Susi was fantastic! I can't praise her enough. She was lovely to work with and organised everything for us so our day was perfect. I would highly recommend her to anyone looking to plan an Austrian wedding. Many thanks! The wedding at Castle Kornberg in Bad Gleichenberg far exceeded our expectations. Thank you Sivia for all your help and support. Thank you so much for putting us in touch with Susanne Dangl.She was fantastic,the day went without a hitch and exceeded our expectations.We know she hasn't organised anything in Obergurgl before, but you would never have known and we learnt so much from each other along the way. I know she enjoyed the day as much as we did. Thanks again for everyone's help. What a magical day! It was lovely.Thank you so much. Wow - even the red carpet!!! And a 'proper' wedding dress + welly boots !! Getting married in Kitzbuehel was the best idea we ever had! We met Susi in September and both immediately felt confident leaving our wedding in her hands. She came up with so many wonderful ideas for our day and knew all the best places to recommend. Susi, and John at Austria Direct, helped us with all the paperwork so organising our wedding abroad was easy! Our guests said it was the best wedding they had ever been to, and the photographer, Martin, captured the day perfectly. Thank you Susi and all your team for making our wedding day so perfect! 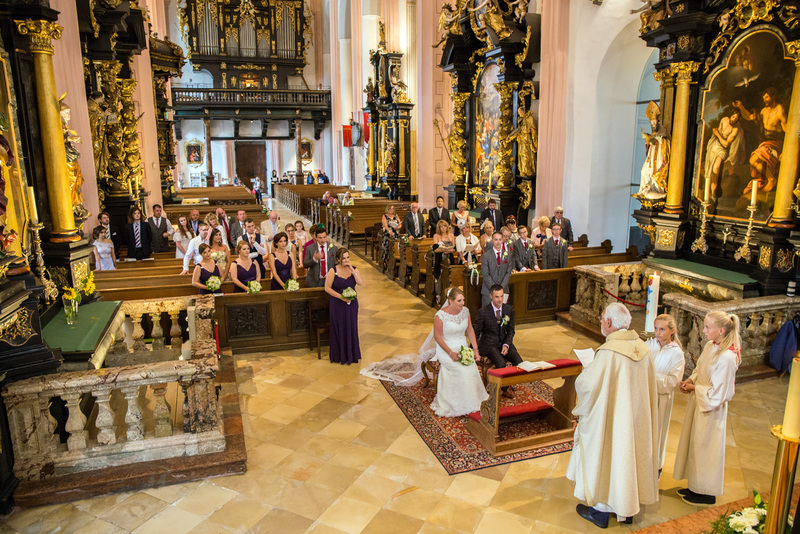 Thank you for all your help with our recent wedding in Salzburg. Your initial information pack and letters proved invaluable to us. The very useful tips, advice and insight helped to point us in the right direction at all times. Our day ran very smoothly, was thoroughly memorable and enjoyable. Yours and Ingrid's professionalism were remarked upon by several guests and we would have no hesitation in recommending your services to others. We had blue skies and sunshine every day in Salzburg and could not have hoped for better circumstances for our wedding. With great appreciation, Tschuss!! Thank you again Ingrid,for helping organise our special day in Filzmoos.Everything went perfectly to plan and all the guests loved every moment. Our thanks to the Unterhofalm for their hard work and to the guys "Jaga-Baum" who made Jodie's day with their rendition of "Candy" - they were as great as advertised, and even had most of the younger brothers dancing - quite a feat! It was a day we will always remember ! Everything (in Zell-am-See) was wonderful and exceeded our expectations! Rudi and his team were so helpful and friendly. They made many extra little touches that just added to the day The weather was a bit overcast, but after the "ash cloud" had threatened the whole event, it was the least of our worries! We all thoroughly enjoyed ourselves and loved the hotel. Thank you so much for everything you have done to make Hannah and Matt's wedding so special. The dust has finally settled and we have had time to draw breath, and just wanted to say thank you for all your help over the last 15 months. We finally made it down the aisle in St.Wolfgang ! We had a wonderful, wonderful time. Thanks again. Thank you for steering us in the direction of Filzmoos for our wedding - an amazing location - and for putting us in touch with Ingrid.She was absolutely wonderful - nothing seemed too much or to silly to ask her.She made the planning process really enjoyable,and it was thanks to her that every detail on the day was perfect ! We can't praise her enough, and if any future clients require a 'first hand' reference for Ingrid's wedding planning services,or for the Unterhofalm as a venue,we are more than happy to oblige. We were thrilled with our wedding in Kitzbuhel. We could not have done it without Susi's help, and her suggestions were spot on,from the venues she selected, to the sleigh rides and the releasing of the balloons. Susi met us the day before the wedding and really helped calm our nerves by taking us to the venues and sorting everything out, and making sure all was well. We felt that everything was taken care of, and superbly organised so that we didn't have to be concerned about a single thing. We would have no hesitation in recommending Susi, as we think she did a fantastic job with our wedding, and we think Kitzbuhel is a great place to get married. The registrar there is a wonderful lady, who completely put us at ease and was, as one guest put it, "sunshine in human form ". Many thanks for your help too,as the initial paperwork takes some organising,but you made it very clear and easy to follow. Thank you so much for everything you did to help us with our wedding in Badgastein. You really went above and beyond the call of duty to help us (and our guests) have a wonderful wedding.Johanna and everyone at Gruener Baum surpassed our expectations and gave us the most beautiful day.All in all,the best decision we made was to get married in Austria and have you help us organise it.Everything was simply magical!